68” wide x 52¼” deep x 20¼” overall height, 8½” load height. 42” wide x 50” deep loading deck with pallet retainers. All welds continuous TIG, pit and crevices free. Stainless steel pneumatic fittings, tubing, and conduit. Gasketed stainless steel covers protect vibrators. Stainless steel floor mounted machine guard for load side of equipment not shown. Adjustable high amplitude electric densification system settles products for maximum fill volume. 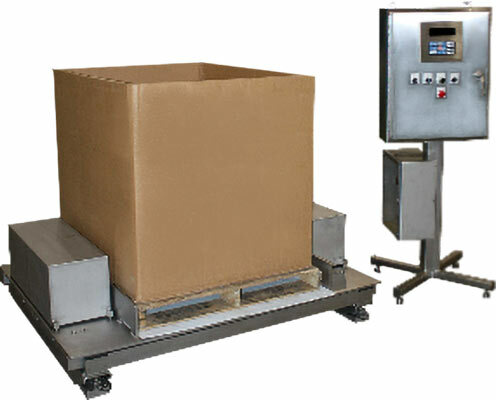 Gain-in-weight scale system with NTEP approved stainless steel weigh modules. NEMA 4X control enclosure with digital batch controller. Solenoids housed in an enclosure with view window for protection and easy cleaning.